Whether you're travelling alone, as a couple or with a group of friends, our infamous Boardmasters hospitality will ensure that you feel welcomed, looked after and prepared for a summer of a lifetime. 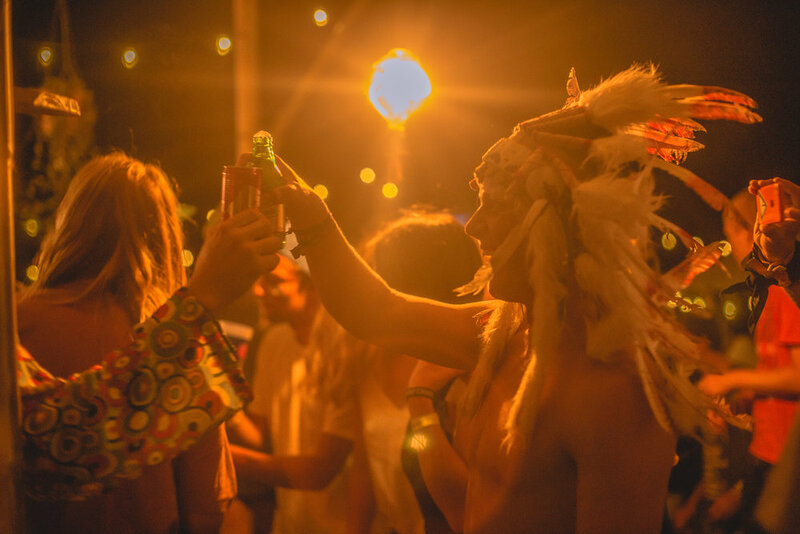 We look forward to welcoming you into our tribe and sharing experiences together - you may arrive as a stranger but you will leave as part of the Boardmasters family. Yes, yes… YES! Boardmasters Surf Camp in France is ideal for EVERYONE! Our mission is to get more people in the waves and sharing our love of surfing. Our Boardmasters Surf Camp in Moliets is designed to encourage novices into their first wave, whilst improving and developing the skills of those who’ve already mastered the basics looking to take their surfing to the next level. With surf lessons available for beginners and surf guides for intermediate-advance riders, you’re sure to find what you need to make the most of your holiday. Not at all… surfing is purely voluntary and only a part of what makes our Boardmasters Surf Camp so special. For those wanting to chill out, top up their tan or make friends on the beautiful beach - we have a range of activities available out of the water. We offer complimentary daily yoga classes, offering the opportunity to fully unwind and find a state of complete relaxation. DO I NEED A SURFBOARD? Both Surf Safari and Surf Coaching packages include free surfboard rental including your wetsuit (if needed), outside of surfing lesson times. Unfortunately we don’t have enough equipment to cater for everyone to surf at the same time, however by rotating sessions we find we have plenty of gear to go around. Yes you can bring your surfboard! Surfboards can be taken on the Boardmasters Bus, we have limited availability (10 surfboards per coach) so booking early is advised. Please remember to pack with lots of protection, unfortunately we cannot be responsible for damage. Flight operators usually charge additional luggage fees for taking surfboards, so please check with your flight operator's Large Sports Luggage policy before arriving at the airport to avoid costly fees. Wetsuits are available free of charge for those who require one, again please note that on Surf Safari packages these can only be supplied outside of surf lesson times. The water temperature in summer is warm, so a wetsuit isn't essential unless you're wishing to surf for a prolonged amount of time (2 hours plus). Surfing in boardies or a bikini will be fine, however if you wish to bring your own wetsuit, a 2/2mm or 3/2mm wetsuit is more than sufficient. I’M TRAVELLING ON MY OWN, WILL I BE SHARING A TENT? Solo travellers are encouraged to share tents on the Surf Safari and Surf Coaching packages as our bell tents accommodate a max of 3 people. Whilst the thought of sharing a tent with people you’ve not met before may be nerve-racking, your roomies will be in a similar situation; and here at Boardmasters Surf Camps we create a friendly environment where interaction and participation are promoted. Whilst you might arrive as strangers, you will leave as friends - making great summer memories along the way. We will always plan to put female solo travellers together and likewise for male. I’M TRAVELLING WITH FRIENDS, WILL WE GET TO STAY TOGETHER? Yes, we always group travelling friends together. Please make sure you and your friends book into the same camping area, Main Camp or Boutique Camp as we are unable to group friends who are staying in different camps. BOUTIQUE CAMPING – WHAT’S THE DIFFERENCE? Our Boutique Camping area is situated just a stone's throw from Main Camp and offers an extra level of luxury for those looking to make the most out of their surf camp experience. This area is a little quieter (max. 80 guests) and benefits from a separate eating area and more secluded yoga sessions. You’ll be staying in our beautiful and spacious 2-man bell tents and sharing with only 1 other Boardmasters Surf Camp guest, so a little extra privacy and great for travelling couples. Inside the tents we provide raised wooden beds with memory foam mattresses, pillows and bedding, power outlets for charging those essentials and each tent is uniquely decorated with furnishings. Although the camps are very close, we advise travelling friends choose the same camp if you wish to be together. SURF SAFARI OR SURF COACHING – WHAT’S THE DIFFERENCE? Surf Safari is for intermediate surfers who’ve mastered the basics and feel comfortable in the water. Our surf guides can show you the best surf spots and give pointers in the water, but you’ll be confident enough to head out into the water on your own. Surf Coaching is for beginners or people looking to sharpen their skills in the water. This package consists of daily lessons and priority on surfing equipment at busy times. Our surf coaches will offer guidance on land first, making sure you understand all the techniques before heading out into the water. Once in the waves the surf coaches will be on hand to monitor your progress, offer advice and help you catch as many waves as possible. WHERE IS BOARDMASTERS SURF CAMP? Boardmasters Surf Camp can be found nestled in the stunning pine forests of Moliets, Southwest France. With beautiful white sandy beaches and a lively town just a stone’s throw from our campsite, you’re sure to have everything you need for an incredible week of waves. The Boardmasters Bus is a stress-free solution for travelling to Moliets. For those travelling on their own or large groups wanting to travel together we can manage the whole travelling process for you. The bus is also a social environment, where you get to meet new people and arrive into camp having already met some new buddies. Regular flights depart from the UK and arrive into Biarritz and Bordeaux airports. If you’re planning to fly and require a transfer to Boardmasters Surf Camp, please select this option in the booking process. Driving your own car to Boardmasters Surf Camp is possible, this gives you a bit more freedom once you arrive in Moliets and allows you to bring more surf equipment. Parking is available in camp free of charge. Yes, we can supply bedding for those who do not wish to travel with a pillow and sleeping bag. Please select this bedding option in the booking form. For those choosing to stay in Boutique Camping, bedding is provided free of charge. You will need to bring your own shower and beach towels, these are not provided. Six nights out of your surf holiday week, we’ll serve you a hearty dinner with variations of desserts. Everyone loves a good BBQ, so during your stay we get the coals burning and the good summer vibes flowing for our delicious Boardmasters BBQ feast. And on the chef’s night off, we highly recommend you join us on the ‘Boardmasters Tour’ to San Sebastián, which is one of the culinary and social highlights of the surf camp week in Moliets, and includes tapas, sangria and partying! For snacks during the day, we have the Boardmasters Snack Shack on-site providing healthy treats, cold drinks, and some naughty-but-nice goodies that will keep you going during your sun-drenched and salty days! The Boardmasters Surf Camp tiki bar will be serving drinks throughout the week plus the town of Moliets has a number of bars and restaurants serving drinks throughout your stay.